Updated September 19, 2016 11:30 LA time. 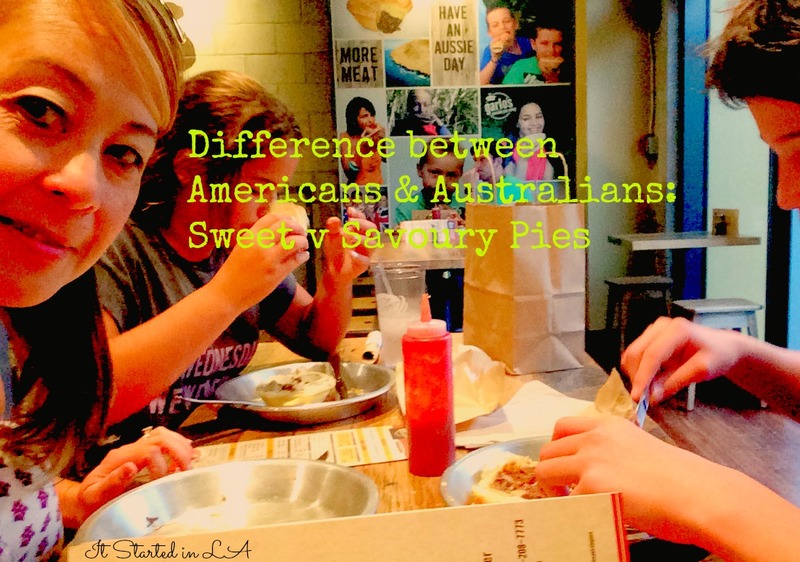 What are the differences between America & Australia when it comes to Pies? What’s the difference between Americans and Australians when it comes to pies? Well the answer lies in two words: sweet versus savoury (technically that’s three). I’m Australian so when you ask me—or other Australians—what comes to mind when you say “pie” I immediately think Meat Pie. A hot, burn-in-your-mouth pie. If you’re American you might think Apple Pie. You know? It’s as American as Apple Pie?! Meat pies are one of those staples you miss the most when you leave home. When we were in Shanghai I made my own pies & sausage rolls. I have made my own pies here in the US but the sausage rolls haven’t cut it. Enter Garlo’s Aussie Pie Shop. That surprises me. My son conducted a taste test with his swim team and at the mention of meat pies one boy said, “Ew, meat in pies!” But give them a pie to taste and it’s true they do love them. “Do you have to teach Americans how to eat a meat pie?” I asked. For my American readers, there are techniques & tips don’t you know! Stacy Garlick says they don’t have a problem with it. (I think that’s because they’re not at the footy or other sporting event trying not to spill piping hot meat all over the place). Australian pies are traditionally eaten by hand. You stick the tomato sauce (ketchup) container into the pie give it a huge squirt then go for your life trying not to spill the ultra-hot contents or burn your mouth. It’s most definitely an art. Eating meat pies is a lot more civilised at Garlo’s though. Typical sides are mushy peas and mashed potatoes but Garlo’s also caters to the exercise-conscious Los Angelinos by providing a green salad option. And, you can sit down and enjoy all of the above in the comfort of their café and use a knife and fork. (That’s actually made me think for a minute … my kids don’t know how to eat a meat pie at the footy. They only know meat pie eating at home and at parties. Time to update my “bucket list” to include giving my kids the opportunity to eat a meat pie at a sporting venue. Oh, the things we take for granted that we forget when we live overseas! Garlo’s also has “American” apple pies and a range of Australian delicacies like Custard tarts, Tim Tams & vegemite. 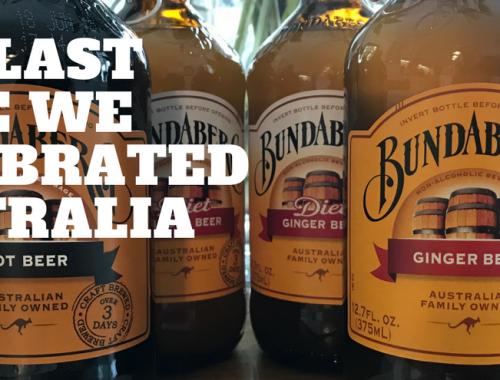 You can find them at Garlo’s Aussie Pie Shop or in person at 1010 Glendon Avenue, Los Angeles CA 90024. Garlo’s also ships America wide. And don’t go in looking for party pies & party sausage rolls … they’re known as sliders here. It might help when you’re putting in your next catering order. Sadly Garlo’s is no longer in Westwood. We’re hoping they’re not gone for long though as we miss them terribly. PS: This is how you get Garlo’s Pies in Australia, at Coles every day. Can we laugh at ourselves? I mean really laugh at ourselves? I’m American, but I did have a lamb pie the other night!! Definitely not the norm here though I will admit! Wow, that’s interesting. Lamb pie sounds divine! Ive never liked sweet pies but I’ve never tried a savory your! Might need to find a recipe for one! I’ve got a couple on my Pinterest board! Yes, big differences!! But I gotta say…I say yes to pie whether it’s savory or sweet!! I’m getting hungry just thinking about it–we love sweet too! They even have vegetarian options!